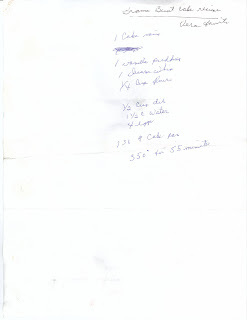 A while back, the ladies in my family wanted to start sharing recipes. My sister, Matti started a blog called Smithalicious as a way for each of us to share recipes. It has been a lot of fun and now we are trying to expand and let more people know about it (hence this post!). I tried to come up with something clever, but I am not as talented as my sisters, so all you get is this with a little story about the recipe you see below. I guess this will be a two-fold post. First, to let you know about Smithalicious. Second, to have this memory documented (which is what blogging is all about, right?). As a teenager, each year for my birthday, my Grandma Smith (she passed away three years ago) would make a cake that I absolutely loved, with a wonderful cream cheese frosting. I do not remember ever telling her that it was my favorite, she just somehow knew. Last year our family got together for the baby blessing of a nephew, which happened to be a week or so before my birthday. My sister, Melissa, called and asked what my favorite dessert was. I told her then she and my grandpa were able to find the recipe. My grandma had written on there (Vera favorite). I must say, it tasted just as I remembered. Melissa then gave me the original recipe that my grandma used (if you look close, you can see the stains on the paper from the many times the recipe was used). So, to get this recipe and numerous other great recipes, check us out at Smithalicous. Please feel free to post comments and/or become a follower of our blog.